Are you looking for the secret sauce to get your hands on a $1,000,000 check from one-day fantasy football? 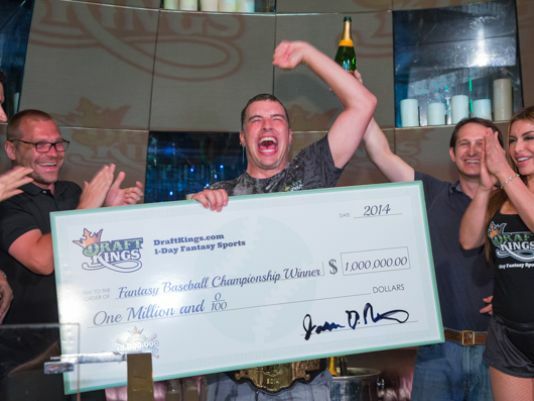 The ecstatic guy (Peter Jennings) below won $1,000,000 from playing daily fantasy sports! While this guide can't give you the golden ticket to winning a 1 st place, $1,000,000 prize, we can give you a guide to create a winning game plan. This guide was created with a long-term mindset and a goal of increasing your percentage of winning over time. You can achieve consistent winning results if you mitigate your risk by creating and constantly improving your tested process. Want to beat the fantasy legend “Condia" and the other fantasy football grinders on top of the leader boards? It's not going to happen overnight. You need a plan of attack and a tested and tried personalized process that you test and test some more. In order to make money over the long-term, you'll need to shift your mindset from solely having fun and guessing on lineups to a more business-like approach. It may not sound as fun, but making consistent money will give you a new perspective. Your new business-like approach requires your subjective, human viewpoint, but is founded in data. The purpose of this article is to lay out a road map to creating your winning process. We cover some of the general tactical strategies and practices that will help you win more than you lose. The primary goal as a money league player is to swing the odds in your favor as much as possible. Find your competitive advantages within the following roadmap. This article will equip you with the knowledge of the different considerations, but no one can hand you the golden ticket. Actually, someone like “Condia" probably could hand you the golden ticket, but he won't because he's winning hundreds of thousands of dollars each week of the NFL season using his system. You need to work and focus your time on creating your golden ticket. After reading this article, you'll know the elements that require the main focus of your time. Go forth and make some cash. It doesn't matter if its $10 or $100,000, set a weekly and season budget and stick to it. If you are new to the game of real money fantasy, you'll need practice. Like anything else, the more you play, the more you learn. You'll get better over time at understanding the nuances of the contests and various leagues you play in. I recommend a weekly budget and a season budget and diversifying your budget according to your lineups and contests. If possible, make your first deposit the total of your first season budget. I will go into more detail on why this is a good idea in #2 below. Initially, break your weekly budget into various types of games or contests. Get familiar with the different games and options for playing against a varying numbers of users and buy-ins. If you have $100 a week budget, play 5 to 10 games each week. You will have varying gains and losses; don't get thrown off your weekly budget and long-term plan. I personally view my winnings as out of play. I don't reinvest my winnings throughout the season. I withdraw my winnings throughout the season. I only play with my initial season budget. 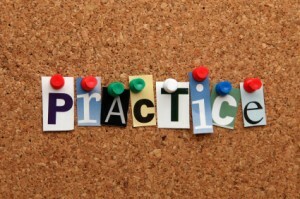 DFC Tip: You'll need money to practice. Freerolls are great, but you won't be able learn all you need to know without playing in every type of contest. Give yourself a budget of at least $150 to throw into practice games. Don't bet more than 20-25% of your bankroll in any given week. It's a grind, not a double or nothing mentality. New fantasy players often make the mistake of thinking short-term. You only get one chance at a deposit bonus. It's going to take some time to release the bonus amount into your real money account. Take a long-term approach to your initial deposit and bonus amount. Virtually all fantasy leagues match 100% of your first deposit only. If you are taking time to research strategies to win, you are going to play multiple games throughout the season. If you can afford it, make your 1st time deposit as large as possible to take advantage of the free money match. New users tend to be a skittish and want a test run, only to inevitably make additional deposits throughout the season. Another common thought is, I just need to deposit $100 and I'll make $10,000 out of it. You will need practice to find the contests, strategy and formula that works for you. If you can afford it, set yourself up with a significant 1st deposit and pace yourself for a long, profitable journey. If you need the money later or want to withdrawal at anytime, you can do so. But remember, you can only get your free money match once. DFC Tip: The average contest is $5-25. You're going to play. If you can afford it, max out the deposit and get the deposit bonus. Each league has different settings and different scoring. Winging it doesn't work. Take 10 minutes to review the scoring and settings of the league and the individual contest before you play. There are critical scoring guidelines to which you must pay attention. For example, Rushing Tds can be worth 6pts, while passing Tds can be worth 4 pts. You must know the scoring and settings before playing any contest. Some important settings to pay attention to: does the league lock rosters once they are set? Most don't, but some still do. Cancelled games and trades can destroy your lineup in a league that locks rosters. You'll want to know how many positions payout in your league/contest. 50/50 contests pay the same fixed amount to the top 50%, while most tournaments pay out a small number of top finishers. If you are in a million dollar tourney with 5,000 players, you will need to take a different approach to drafting than if you are playing in a 50/50 with 50 players. Know the settings of each league you are in assess your risks and draft accordingly. What seems like a simple step is one that many users skip to their own demise. DFC Tip: Every site has a page with the scoring breakdown for NFL. Bookmark this page and make it an easy find for you. The most important single act you can do to improve your chances of winning any league is to practice. Before you blow your bankroll on a $1,500 entry fee, play a ton of smaller entry games. Learn from the Grinders (every day fantasy grinder players). Play the top players on the leader board in $2 Head-to-Head (H2H) games and see how they draft. You will be shocked at the players on their teams. Newbies tend to draft with their heart, and while there is a place for that in the thought process, it can't be your primary method of drafting. You won't have a team full of superstars. In fact, you will rarely see a winning salary cap team with more than 3 superstars. The 2 nd tier players that consistently hit numbers across the board are the diamonds in the rough that win money. DFC Tip: Play every type contest at least 5 times before investing a large percentage of your bankroll. Freerolls are a nice introduction to play the various contest types, but you may not be playing against the best players. Try to practice against the best users you can find and analyze the teams they play against you. You'll soon see patterns in the types of players you should be targeting in your analysis. It's a good start to shifting your mindset into business mode. You can find H2H matchups for as low as $1 with grinders. By the end of playing each contest, you'll have a good idea of which contests you want to re-visit and focus on. This is probably the step most dreaded and ignored component to winning. Players ignore or forego it, because it takes time. However, this step can be really fun and challenging. It's like a treasure hunt to find the best talent at the best value. It's up to you to find the metrics and advantage over your opponents. This step is an integral piece to winning long-term. If you just want to have fun and lose money, skip this step and pick your favorite players without looking at matchups or statistics. However, if you want to win money on fantasy leagues, do your research, create and improve your process over time. Trial and error is a common theme in this article and devising a game plan for researching is no exception. List the metrics that you believe will make the difference. For example, matchups are a common first place to look. What team has the worst passing defense? What players on the team that are playing the team with the worst passing defense? How many points does the opposing team give up per game? How many yards to receivers, running backs and tight ends? How does the opposing team play in the current conditions of the game location? What players are injured on the opposing defense? Document your success researching different statistics. Over time, you will determine what metrics are important for you to monitor. Once you realize middle-tier players are often the key to winning, look at key injuries to offensive position players (primarily running backs) that get a ton of targets or are in a run-and-pass happy offense. Is there an opportunity to pick up a RB backup on a run happy offense at a low salary? By devising your own game plan and honing it over time, researching becomes less cumbersome and overwhelming. When you are prepared and have an idea of what you're looking for, research becomes faster, easier and definitely more fun. Once you have your game plan and at least a rough idea of the statistics you want to research, the next step is find the right resources. You don't need to reinvent the wheel and code an algorithm to tell you what defense gives up the most passing tds. Someone has already done the statistical analysis for you and the data is waiting for you to find it. You can rely on websites that feature expert picks that are theoretically based on the data or you can trust yourself to find the data yourself. Every newbie is looking at Fantasy Pros, ESPN, Bleacher Report, FFToolbox and Yahoo sports for the top Fantasy Players of Week X. While some of these sites can be beneficial to gather a portion of data that factors into your own system, you will need to take the analysis 2-3 steps further. You'll end up being in the bottom two-thirds of every league if you follow the same pattern as every other player. There are tons of niche fantasy sites that provide deeper analysis and insight. If you have to take the lazy route to research and resources, at least find a fantasy analysis site that isn't listed above. There are free and subscription based sites that provide weekly value picks. Some sites will even provide a value score for a particular Daily Sports fantasy league. Most resource websites (like this one) is an affiliate websites, meaning we get paid for referrals to the daily fantasy sites. The result is often that the affiliate website will focus on one fantasy money league over the others. Each money league provides data feeds and the more sophisticated affiliate websites will base their projections off this data. This is important, because you need to be aware if you are gathering fantasy points projections for DraftKings. Create a game plan, find the resources and do your research. Skip this step and you'll find yourself in the bottom 25% of every contest. DFC Tip: Every fantasy money player has resources they rely on. The most successful players build their system around the same resources and data that anyone can reference. The secret sauce is the subjective input used in the 2nd & 3rd step of analysis you create offline. Winning on money leagues isn't magic, it's a matter of creating the winning system from the same resources as everyone else. This can be helpful for fantasy veterans and is essential for fantasy newbies. It's easy to get thrown off track as you are drafting your team online. It's exciting and there are tons of superstar options. There are blinking lights and the streaming chat is a good source of entertainment. However, it can be overwhelming and distracting. Creating a roster offline cuts out a majority of the extraneous noise on a fantasy site. By this time, you will have compiled the metrics and resources you're using to draft your team. You know the difference between a Tier-1 player and a Tier-2 player. You can export salary data into Excel from the league or contest in which you are playing. Now it's time to run your own layer of analysis (subjective and/or quantitative). Here is an example of building a system: document the roster positions and select 10-15 Tier-2 position players based on your judgement (should include metrics you deem important). Create a value system. A simple one is to add a column of projected fantasy points and divide this column by the player's salary. You will have a quick and easy value number by which to select your players. Do the same for 5-6 of your “lockdown" superstars for each roster position. Keep in mind that depending on the type of league, you will need to have a certain roster variance from the other players in the league to win. Tier-1 or “lockdown" superstars take a large percentage of your salary and will be drafted at a higher percentage. In order to create your roster variance, find the value players that will produce and be drafted at a much lower percentage. You may make changes throughout the process, but by narrowing down your potential roster candidates you are creating an advantage. Having your value picks vetted, ensures you don't get caught up with any outside noise. Regardless of what players you draft from your offline roster, you will be getting “value" from your roster. As you draft, stick to your offline roster and don't get distracted. DFC Tip: All your old contests are located in the My Account section of your league. Additionally all the other teams of the users in that particular are also documented. Export this data and store the history. Use this data to compare to your previous projections. Test your system by adding or subtracting metrics based on past your success rate. If you play consistently week over week, you can find patterns and identify high value players that a low percentage of players drafted. Save and compile this data. Mirror your excel documents in Google Docs to access on the road if you need to update your roster from your mobile phone. Drafting strategy varies widely depending on the type of league or contest in which you are playing. You'll need to come up with a specific strategy for the different types of leagues. However, regardless of the league you are playing in, drafting always starts with data. This step is essentially to convince you that you need a paradigm shift in mindset. While it can take some of the “winging it" fun out of drafting, your winning percentage will increase if you draft on data rather than emotion. Calvin Johnson just had a 250 yard, 2 touchdown performance and there is no way you are not drafting him this week as he goes into Philadelphia for a showdown in 3 feet of snow. You won't consider other options and you'll end up losing your money this week. If you want to draft a successful team, you must start with data. You need to consider the passing conditions and Matthew Stafford's record and experience throwing in 3 feet of snow. Doing your due diligence will pay off. There are tons of websites that provide the basic historic data on every offensive player in the NFL (you should have a list of trusted resources at one point). The baseline data set is important, but you need to go several steps further to build your competitive advantage. If you are mid-season and analyzing a player's performance against a particular team, consider how other players in the same position and skill set performed against the same team. Data is limited on NFL players versus particular teams, due to the length of careers and season. However, you can look at other similar players and include that data in your analysis. It will give you a broader set of data. Don't get caught up with what Roddy White did for you last year if he's clearly a hobbled cripple this year. You want the most current data on both sides of the ball. When analyzing data, your goal is to identify the highest value picks that majority of others aren't considering. These value picks will make the difference between winning and losing in most league formats. Value picks are players that have a high value ratio (projected points to salary). Here is a real life example from Week 14 of the 2013 NFL season. This example demonstrates how lower salaried players can perform at a similar or “higher" value than Tier-1 players. This data is not meant to be all-inclusive. However, you will find that over the long run you can consistently find value picks that will cost less and perform. The scenario is, you have $14,000 left and need two wide receivers. Your vetted offline roster includes the following Wide Receivers: Josh Gordon, Calvin Johnson, Keenan Allen, Mike Wallace, Julian Edelman, Larry Fitzgerald, Eric Decker. There are other variables, but hopefully this chart demonstrates how 2 nd Tier player combinations are formidable and often have a lower cost. Create a system that outputs high value projections and you will be able to draft more on data. When faced with the following example, a person under an emotional mindset will be tempted to throw out reason and data. The emotional mindset says, I want Calvin Johnson, so I'm going to draft him. However, once you spend $10,000 on Calvin Johnson, your risk increases. You won't have enough money left for the other players on your vetted offline roster. You will be introducing increased risk, which is the opposite of what you need to win. The highest combination from your vetted offline roster is Keenan Allen (19.4 pts) and Larry Fitzgerald (21.6 pts), for a total of 41 points. It also happens to be one of the few combinations you can afford. It doesn't always work out this well, but more often than not, you will come out ahead if you create a system based on data and trust your process. Your vetted offline roster was created on research and data, so trust it. Your draft strategy will change based on the league you're playing in. Tournaments require higher risk roster players and tactics. In virtually every salary and format, you will likely be able to draft 2-3 Tier-1 players. You must pick your superstars correctly. You can't afford to spend a large percentage of your budget on busts. A high percentage of other players in your league will likely draft the same 2-3 superstars, so you'll need to find your competitive advantage with your other value picks. Compare value across roster positions. Do 2nd Tier Quarterbacks produce the same amount as 1st Tier Running Backs? 2nd Tier Quarterbacks can often be the same price as 1st tier running backs and yet Quarterbacks can put up equivalent or more points. If this is the case, you can find a value Quarterback. As you hone your process, you'll determine what data is most important to you. Don't get caught up with emotion and be thrown outside your process. Draft on your researched data and find the value picks. DFC Tip: Salary is based on perceived value. If a player is blowing up in recent weeks, his salary will likely be high and so will emotional attachment. The winners in money leagues are those that can predict the next player to blow up. If you are in a high-entry tournament, you will need to take calculated risks. Find players with high ceiling point potential. Use data to predict future high value and identify the players who won't be widely drafted. Contest selection can make or break your bankroll. There are a number of different types of NFL contests. The contests vary somewhat depending on the league, but for the most part you'll see the same offerings. Your goal is to play each and every type of contest multiple times. Play in $0 or $1 contests to get experience. Join Head to Head (H2H) matchups with the users on the leader board while you practice. Don't risk more than $1-$2 per matchup while doing so. At a minimum, you need to become familiar with the different formats, drafting types, and payout structure. Ideally, you will devise a specific game plan for each specific contest in which you participate. As you play multiple games, you'll be drawn to a specific type of contest or contests. Find the contest that intrigues you the most. Once you've established the contest you have the greatest affinity for, study and create a specific strategy for that contest. Guaranteed Prize Pool (GPP) Tournaments – Called a tournament, but GPP's normally consists of one weekend of games for large prize money. The prize pool is guaranteed beforehand and number of entrants can get as high as 3,000 while entry fees normally range from $12-$5,000. The GPP's are the contests that make 1st place prize winners millionaires. See our GPP Tournament Strategy article for in depth analysis and strategy. Head to Head (H2H) – User vs. User in a head to head matchup. The winner sees the prize money. You can create a H2H contest or join an existing one. Want more H2H strategy? Click here. Leagues (Standard) – This is the most common or standard contest. The majority of these contests are between 5 to 20 entries going up to 250 entries. Buy-ins are normally in the $0-$25 range and payouts and/or prizes are tiered with the majority of the winnings going to 1 st place. 50/50 (Double-Up) – The top 50% of the entries win double their entry fee. Every winner receives the same price amount. Satellite – A tournament in which you can win a free entry or pay to enter. The prize is an entry into one of the larger tournaments and depending on the size of the satellite only awarded to a small percentage of players. In Satellite tournaments of 14 people or less, there will likely be only 1 winner. Bracket- A tournament in which you play only 1 other user in the contest and advance in the tournament if you win. Think of the NCAA college basketball tournament. Salary Cap: There are normally 3 categories within Salary Cap drafts (Beginner, Standard, Expert). 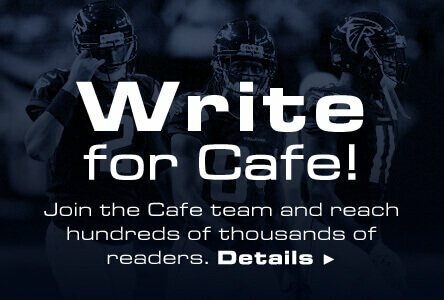 Beginner salary cap contests provide $65,000 to draft your team. Standard provides $60,000 and Expert $50,000. Pick'em: This can vary slightly, but there are groups of players and you draft 1 player per group. So, if there are 8 groups of players, you will draft 1 player from each group to complete your team. Daily: In a daily format, the contest will be completed in 1 day. The players you draft will only be from the teams playing on that particular day. Multi-Day: There are some bracket and standard tournaments that will take place over the place of a few days. Win day 1 and you'll advance to day 2, etc. Weekly: These contests are common for NFL contests. The contest lasts for an NFL Week. These contests usually start on Sunday, but can also start on Thursday and include the Monday Night Football game. Payout Structure: You must be familiar with the payout structure of the contest you are in. The number and structure of payouts dictates the approach you take to the players you draft. For example, in large tournaments, you'll need to take far greater risks than in a 50/50 contest. Rake Percentage: Know your league rake. Every daily sports fantasy league takes a rake or percentage from each game played. This is how money leagues make their profit. If you are planning on making a living off of fantasy sports and will be playing high volume, you'll want to calculate rake percentage into your profit and loss statement. For individual league and contest rakes, check our league specific strategy pages. The average player can skip this step and factor a 10% rake as an average on most contests. DFC Tip: Fantasy grinders make consistent long-term earnings on H2H matchups. Even if you do play in long shot tournaments, diversify your risk and play in favorable H2H matchups to keep your bankroll positive. Some fantasy sites allow you to view user history and winnings per sport. Study users and target users. You don't want to play the grinders in the top 10 leader board when you're risking your bankroll. Utilize all the data on hand to choose which opponents you play. You can find lists of grinders on RotoGrinders.com and see their usernames on all the fantasy money league sites. Make sure you aren't playing against the top 25-50 players. The fantasy grinders that make the most money play in a diverse range of contests, but earn their consistent cash on playing Head to Head (H2H) matchups. These users are better than most and win a majority of their H2H matchups. There is a limit of 20 games they can play in per day, thanks to the super grinder Condia. However, losing 18 out of 20 matchups to a grinder isn't any fun. Stay away from the users at the top of the leader boards. Be careful when creating Head to Head matchups as fantasy grinders will scoop up as many H2H as they can and game you for everything you're worth. Until you have a proven track record, refrain from creating your own leagues. Join H2H matchups with users that don't have a long track record online and don't have thousands of wins under the NFL column. Playing in large payout tourneys is fun, but it's much closer to buying a lottery ticket than making a calculated risk. Create a strategy for finding the contest and or matchup that swings the odds in your favor. If there are 8 players in a 10 player tourney, take 5 minutes to look at the player history on the other entrants. Study the contests, find the contests that decrease your risk and devise a drafting strategy for each type of contest. DFC Tip: Before playing a user in H2H, click on the username and look at their history the website. You'll see a breakdown like you see below. You want to find users who have recently joined and/or have a low number of wins in the sport you're playing. Chances are you will draft your team a significant amount of time before the contest actually starts. There are many different elements that can change from the time you draft your team and the time your contest starts. Here are some: injuries to your players, injuries to players who throw to your players, injuries to any offensive players, injuries to opposing players, benching, legal trouble, personal issues, weather, trades, cancellations and the list goes on. You may think these aren't important to pay attention to, but think again. If you are in a $1,000,000 and you draft a person who gets concussed out of their last brain cell and can't play, it can ruin your chances. You don't want to regret losing because you were too lazy to check on your team before the contest starts. Don't be the 85 year old man telling your grandchildren that you could've been a millionaire if only you checked to see Reggie Bush hurt his sensitive groin in pre-game warm-ups. DFC Tip: There are mobile and email alerts available to make this easy on you. Find a real-time streaming resource and make it easy on yourself. Bottom line, you can reduce risk by finding great resources and establishing a structured process. However, you'll also need to rely on your instincts and some luck. Taking the step to a higher level analysis will give you an advantage over most players. However, over time, players will become more sophisticated and most will have a system. Your golden ticket is your ability to add your subjective opinion to the equation. With all the elements (data, resources, system, contest) equal, the secret sauce will be your ability to predict winning players at a higher rate than your fellow man. The amount of luck you'll need will vary based on the type of contest, but taking the steps to prepare will reduce your risk and the amount of luck you will need. The result will be you winning more cash on fantasy football.